The columbus machinery movers that also are experts in press relocation. 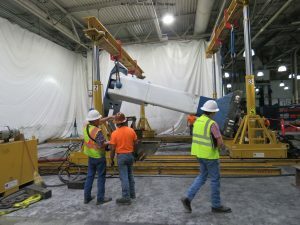 Our Columbus machinery movers performed an interesting press relocation project recently here in Georgia. This heavy lift is just short of 120,000 pounds. We utilized our 240-ton hydraulic gantry system to easily lift and transport this press body over 150 feet. Most noteworthy in an operating facility. Our millwrights then laid the press assembly horizontal for machining. Then it was up-righted and placed in its final location. At these weights you want a contractor that has experience. Our Columbus Machinery Movers are experts in press relocation and assembly. Our Columbus Millwrights can decommission, and disassemble, any type of industrial equipment. We; receive, install and perform final assembly, of new, and re-manufactured industrial machines daily. It is difficult to be an expert in all machine manufacturers. We do our best to research each installation and gain all pertinent information. This will assure your machine installation goes smoothly. We have the experience and resources to mitigate issues quickly.